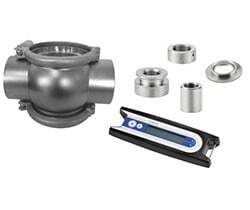 The In-line Instrumentation Body makes a hygienic flexible connection in any piping. It provides the benefits of integrating one or two instruments into process systems without compromising on the flexibility and ability to clean the systems. The Alfa Laval welding adapters are designed to fulfil the demands of hygienic process connection for instrumentation into tanks. The adapters fits into the dairy, brewery, beverage, food and pharma industry.